Takasago International Corporation is a leading company in the Flavors and Fragrance industry. Headquartered in Tokyo, Japan, it has business operations in 27 countries and regions worldwide. The Flavors Division of Takasago International (Singapore) Pte. Ltd., hereafter “Takasago Singapore”, collaborated with Macromill in a neuro-physiological study to better understand female consumers’ flavor preferences in Indonesia. Typically, consumer flavor testing is conducted using a structured questionnaire. In general, Asian consumers have a limited vocabulary in describing flavors, and they tend to be relatively reserved and polite in their responses in some countries. Flavor testing using liking questions and verbal rating scales may lack sensitivity, making it difficult to discriminate between top scoring flavors. Takasago Singapore was keen to explore the use of physiological indices like electroencephalogram (EEG) to evaluate consumers’ flavor preferences more objectively. Macromill used neuro-physiological study method combined with conventional survey. The neuro-physiological study is one of Macromill’s unique neuro research methods that employ physiological indices such as EEG, heart rate, and skin conductance. When combined with subjective indices, it can generate insights in areas that respondents are not aware of, which was not quite possible with questionnaires and interviews only. In this study, we tested six flavors (F1~F6) for a beverage in a blind sequential monadic design with order rotation. Respondents were asked to cleanse their palate between testing with timed resting periods to avoid taste fatigue. Devices that measure EEG (Alpha-Back, Beta-Left Front), heart rate, and skin conductance were used by respondents during the evaluation. 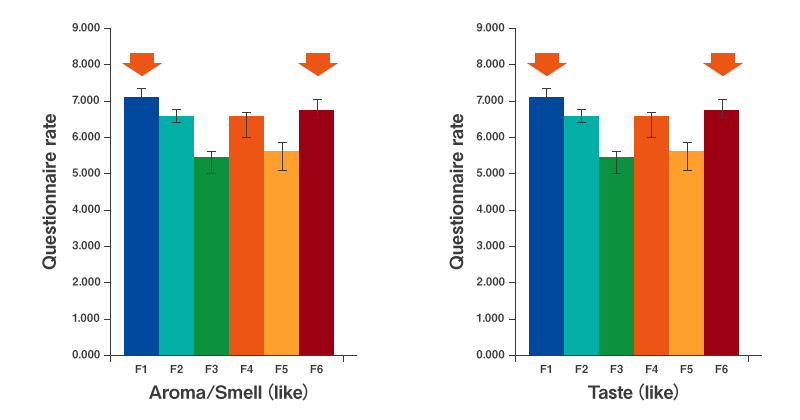 The analysis of physiological measurements and questionnaire results was undertaken from two perspectives: smell and taste. Survey results looked at attributes related to aroma, taste, sweetness, bitterness, etc. Physiological responses to the six flavors were also evaluated based on indices related to arousal or calmness. Finally, correlation analysis was undertaken. The survey results show that among six flavors (F1~F6) we tested, two flavors, F1 and F6, both received high ‘Overall Liking’ scores using the survey approach, “Conscious Responses” (Chart A). Although F2 and F4 scored similarly high, the total evaluation for F1 and F6 was better than others when looking at all attributes. For this reason, the analysis of physiological measurements, “Unconscious Responses” (Chart B), was undertaken for F1 and F6 in particular to provide an additional insight to the drivers of liking, which differentiate the flavors in terms of associated feelings and appeal to women in the Indonesian market. Chart B below shows physiological measurements, EEG (Alpha-Back and Beta-Left Front), heart rate and skin conductance. These measurements provide following indices: EEG Alpha-Back and skin conductance of arousal and calmness, EEG Beta-Left Front and skin conductance of pleasantness. The extent to which each score is below or above the black dotted line (control by water) represents the strength of respondents’ emotional reactions. The chart for EEG Alpha-Back indicates that F1 performed better only in terms of calmness. F1’s score went below the control line, meaning that the least suppression in occipital alpha power was observed. This suggests that respondents felt calm as they were consuming it according to a series of previous physiological studies. It may be that respondents associated the test flavor with beverages that they drunk on a day-to-day basis. On the other hand, F6 was evaluated as the option that stimulated arousal (EEG Alpha-Back and skin conductance) and enhanced pleasantness (EEG Beta-Left Front and heart rate). High suppression in occipital alpha power was observed in addition to high skin conductance. This suggests that respondents experienced positive feelings as they were consuming it, possibly with pleasantness. Based on the findings, the test flavors F1 and F6, which were both top scorers, garnered different emotive feelings from the physiological responses. These physiological responses can be considered as their strengths, the reason behind the female respondents’ choice of top testers. Relatively, F6 appeared to have more potential in the Indonesian market as it received more positive feelings. Our neuro-physiological study provided Takasago Singapore with an objective understanding of the underlying emotional responses of consumers for the top scoring flavors. This sophisticated approach we provide together with Centan, a neuro marketing pioneer, has given Takasago Singapore a more sensitive assessment of flavors and ways to optimize flavors to maximize consumer preference. *Note to Readers: This study was conducted only among female consumers. Further research may be needed to validate if the same results would be apparent for male respondents. Takasago International (Singapore) Pte. Ltd.